Kirkpatrick Macmillan, an inventor, was born in Keir (Dumfries and Galloway) in 1812. He was a blacksmith at Courthill Smithy, Keir Mill, Dumfriesshire. 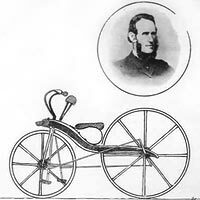 Kirkpatrick MacMillan developed the first rear-wheel driven safety bicycle in 1842, which allowed the rider to power the bicycle by means of pedals attached to levers and then attached to the rear wheel. This proved a success as the Hobby Horse, which was popular at the time, only provided momentum through the swinging of the riders feet back and forth. He, however, never patented his idea and it was therefore widely copied. Fellow villagers thought him 'mad' for dreaming up an idea such as the first pedal-driven velocipede. But, although known locally as 'Daft Pate', he became in 1839 the inventor of the pedal-driven bicycle, used by millions today. He rode his cumbersome machine 68 miles over rough roads from his tiny smithy home (still intact today) to Glasgow, visiting his two school teacher brothers in the city. In June 1842 the inventor was fined 5 Scots shillings for speeding at 8 mph into the Gorbals and knocking down a little girl in the crush that awaited this 'Devil on Wheels'. The magistrate at the Gorbals Public Bar was sufficiently impressed to ask Macmillan for a figure-of-eight demonstration in the courtyard, and is said to have slipped him the money for the fine. Having raced the stagecoach on his return to Dumfriesshire, Macmillan went back to the quiet life, but his invention was copied and an English firm put it on sale at seven pounds. Macmillan's early machine, still seen in reproduction at the Transport museum in Glasgow's Kelvin Hall, met demand for easier travel. It had wooden wheels and iron-band tires, and was so heavy (57lbs) that he pushed off by striking the ground with his feet, protected by iron-spiked boots. He married Elsie Gordon Goldie at Keir in 1854 and fathering 6 children between 1855 and 1864. He was one of the characters of 19th century rural Scotland. His son, John Macmillan of Liverpool who became a policeman in that city, told how his father, a keen churchman, refused to let the family even read on a Sunday. He pulled teeth for both horses and humans and was a popular fiddle-player at weddings. He died on 26 January 1878 aged 65, and the plaque on his smithy home reads 'He builded better than he knew'.